Like a fishing log book, collecting underwater video clips of your favorite fishing spots can be just as useful and way more cool. 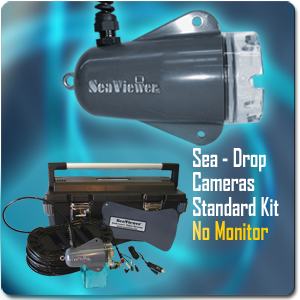 The SeaViewer™ underwater camera has a video out jack that makes this possible. The recording equipment you use can be as simple as a personal camcorder which has a video in jack or something a lot more sophisticated like the Sea-DVR™. Once the camera is hooked into the recorder it’s just a matter of hitting the record button and letting the camera lay down footage showing your favorite fishing spot to be viewed later in the comfort of your home. Decide on a alphabetic/numeric format that will allow you to keep the tapes organized by body of water, year, sequence or date and content. One way to do this is to make a label like this: St. Clair 10 #1 Belle River Hump end (Lake St. Clair, 2010, first tape, footage from the end of the Belle River Hump). It can be shortened even more by using SC10#01 which leaves more room on a small label for more content names (spot names). Label the outside of the tape you are using directly on the cartridge. If you only label the case for the tape at a later date the two may get separated then you might have to take a long look at the video on the tape to figure out what it is. I have a couple of tapes of great footage without any way to determine where it came from. Keep a separate paper log of your trip and the tape name. A bound notebook works well because the cover can protect the pages from spray on the boat and all of your video reference library will be contained in one place in the order you originally developed it. Take advantage of the tape counter which is a standard feature on both old and new recorders and log in specifics about each video clip by the start and finish counter number and content. This makes going back to find exactly what you want to look at later productive and enjoyable. Keep clips short – A shorter clip helps to make the content title more descriptive and running the tape up to the exact spot you want to watch a lot easier. Shorter clips also allow for targeted comments in the paper log where you can enter GPS coordinates, structure, seasonal and environmental information to aid with further research on a spot. Watch for an upcoming blog, Collect Video Clips of Your Favorite Fishing Spots #2, where I will talk about getting the most out of your video taping in the least amount of time and get back to what we love to do…fish. I came across my first school of fish which was not totally unexpected but nothing I had read, watched on TV or heard about prepared me for this: schools of drum, smallmouth, rock bass, walleye and white bass all together in one eddy but in separate schools. Prior to this moment, based on time of year, water temperature, depth and current I would have put one species in that spot at a time. This little bit of knowledge gained through the use of the underwater camera launched my confidence in keying on big smallies when other species in the area are being caught. It wasn’t much after I started using the camera that the experimentation began. To use the stabilizer fin or not to use the fin? OK, found out that no fin added up to no stability. Hey, I said it was an experiment! The head would spin doing 360 degree swings back and forth with an occasional moment of stability. I wouldn’t recommend this after lunch. So when drifting, the fin is on and the camera is steady while I get a look at the bottom structure first hand and continue my quest to understand how the fish relate to it. To get started I recommend making sure the batteries have a full charge then just go out and have fun. Once the desire kicks in to seek out specific spots some prior planning comes in real handy. Set up your plan to approach the spot before ever hitting the water. Think about what it is about this spot that interests you the most and have your video recording unit ready or pad of paper and pen to record the results. Record every data detail you can think of for future use: Date, time, wind speed, wind direction, water temperature, sky conditions, water quality, depth and leave room for comments. Do all of this and you can build a useful library of each experience to be used at a later date. WHAT UNDERWATER CAMERA DO I USE? One time I came across some boulders with 4 lb. smallies on them in the river with my underwater camera. Even though I turned the boat around and went back I never did find those boulders and those beautiful bass. Apparently I was not able to get the camera back in the right position that day, nor did I do so until five years later. I have since found the boulders and they have become a reliable spot to frequent during tournaments. It would have been nice to have the spot marked on the first past with SeaViewers SeaTrack GPS Video Overlay unit. This accessory allows me to lay GPS coordinates on my recorded video for viewing later. Under the water the camera passes by structure faster than it would take to reference a GPS/Sonar unit and write the coordinates down for everything you see. Now I can watch the video in the comfort of my home and pause when I find something worth going back for. As of this writing I’m still storing my video on a mini DV camcorder then transferring it over to my computer or DVD. What I should be doing this year is using the Sea-DVR which gives me both a screen and a method of recording my video on an 80GB hard drive. Recording capacity and the ability to transfer high quality video to other mediums will be easier than ever. Words cannot describe the value of either of these items. 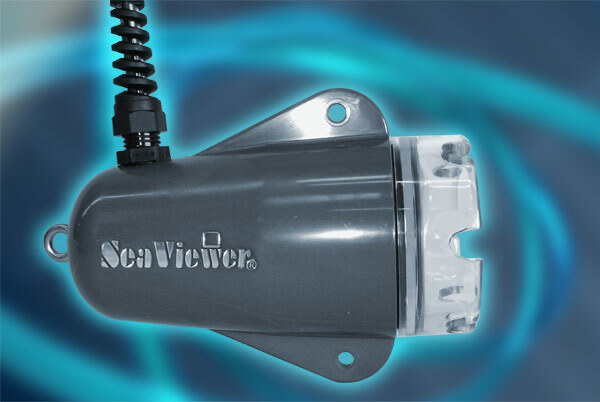 It’s much better to see real video and more on the SeaViewer site. A 50′ cable will be enough for most fishing applications however let’s take a look at some situations that might fit your circumstances where something longer than 50′ came in handy. I do a lot of research in the St. Clair River and there are holes that go 60 – 80′ deep. The deepest bass I have on video comes in at 57′ yet at this time I don’t have any productive water I would recommend at that depth. The value of going deeper is the same as the value of examining structure that is shallower than a hot spot you are fishing. We can learn a lot by understanding what makes the spot tick and finding both limits of the productive range. This is real top shelf information if you are a researcher like me, a tournament angler or die-hard enthusiast that loses sleep over questions like this. For most recreational anglers finding bass with the camera and getting a clear picture of the environment the bass are in is a huge benefit that pays off in better decision making and catch rates down the road. In this case a good question to ask is, “How deep do I fish now?” “Am I looking for new spots to fish, perhaps spots that other anglers haven’t found yet?,” is another. The depth of the water you fish is important too. In an inland lake with no current a summer thermocline develops (a boundary between warmer water with more oxygen riding on top of a lower layer of cooler water with low oxygen levels) that fits within the 50′ range of the cable. That’s where most of your productive bass fishing will be. If you need to see something at exactly 50′, a longer cable will probably be necessary. One thing that affects this is the few feet of cable that is above water and connected to your viewing screen. Another is an element of friction on the cable which is caused by the water pushing on it between you and the camera head. A natural bend will develop in the cable if you are on the move which can create a shortfall in length of two feet or more. A story about a dramatic camera rescue is in my first book, No Secrets On Lake St. Clair Vol. 1. The crux of the story is that it all comes down to curiosity. There are some things you will want to take a closer look at like a cavity under a rocky bank, a shady spot under a downed tree or a wreck with all kinds of bad angles and opportunities for the camera to become lodged inside. The camera I used in the No Secrets story didn’t have it but the camera I use now has a 1000 lb. pull strength reinforced cable. Needless to say my comfort level is a bit higher these days when I decide to use the camera for exactly the reason I bought it…to see things that are extraordinary and find some fish that other anglers aren’t aware of. Prior to getting the underwater camera I have now I can show you some grainy video clips with static. For an immediate return on my on-site information some of this can be tolerated but once you decide to take the video home and look at it, the importance of getting a clear picture quickly overrides the value of the information returned. The folks who make the camera I used are dedicated to pushing the quality of the video signal return through the longest length cable possible. We Need A Bigger Boat For Lake St. Clair...Really?